In early October, the Crystal Ball discussed the election-to-election relationship of the percentage of the total statewide vote each Virginia locality casts. 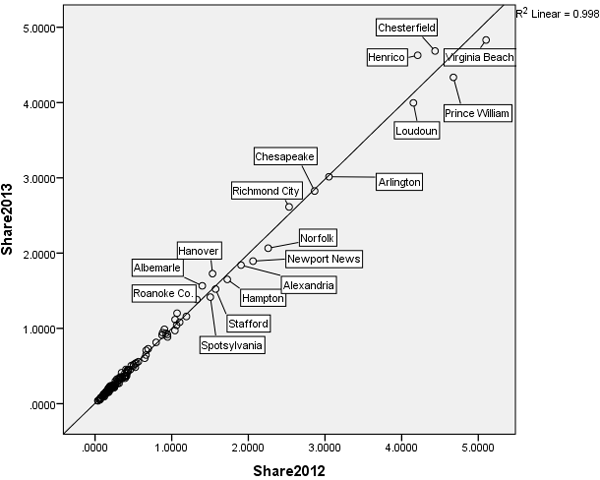 While the correlation between 2009 and 2012 vote shares was almost perfect (R ­= .996), there was noticeably large voter drop-off in a few cities and counties in the Old Dominion’s off-off year gubernatorial election. But what about the 2013 gubernatorial race versus the 2012 presidential race? This time around, based on figures available Tuesday, the correlation between the 2012 and 2013 results is R = .999, even closer to 1, which would indicate a perfect correlation. That statistic reveals that the relative influence of most Virginia localities’ vote totals — that is, the share of the statewide vote each provided — remained more static from 2012 to 2013 than from 2009 to 2012. Note: Fairfax County (13.73% of the vote in 2012, 13.65% in 2013) has been visually excluded from the chart in order to better view the data. But its data were included in the actual calculations. If we dig into the results locality-by-locality, we can see why the vote shares more closely mirrored each other this time around. A good place to start is the percentage change in the vote shares of the state’s cities and counties. From 2009 to 2012, the largest increase and decrease ranged from +43.4% in vote share to -37.3%. But from 2012 to 2013, the range was a more constricted +19.1% to -21.4%. In comparing 2009 to 2012, the median increase was 7.5% while the median decrease was 10.5%. However, from 2012 to 2013, the median increase was 5.8% and the median decrease 5.6%. In other words, even though the electorate was predictably a lot smaller in 2013 than 2012 (43% turnout compared to 72%), the drop-off in turnout was fairly uniform throughout the state. Perhaps that’s why exit polls showed that the 2013 electorate looked a lot like 2012, a helpful development for Democrats that helped Terry McAuliffe win the governorship. Perhaps most tellingly, some of the outliers that had much larger vote shares in 2012 than 2009 had 2012 and 2013 shares that were closer to equal. Two politically vital localities that stand out are the northern Virginia swing counties of Prince William and Loudoun. Whereas these counties saw +23.8% and +25.8% shifts in their shares of the statewide vote from 2009 to 2012, respectively, they only saw shifts of -7.3% and -3.8% from 2012 to 2013. After seeing huge upswings in vote share in the presidential election in 2012 from 2009, it’s noteworthy that the 2012 to 2013 drop-off in these places was relatively small. Even accounting for the difference between one year and three, the 2008 to 2009 vote share percentage change in these counties was -13.5% for Prince William and -11.9% for Loudoun, larger than the 2012 to 2013 change. McAuliffe captured these vital counties last week. Prince William and Loudoun are two examples of counties with large and diverse suburban and exurban populations, ones that turned out at much lower levels in 2009 than in 2012. Those 2009 troubles exemplified the concerns among Democrats about non-presidential election voter drop-off among Democratic constituencies. But at least in the case of the 2013 Virginia gubernatorial election, the 2013 electorate actually looked fairly similar to the 2012 one. On Nov. 5, more than two million voters cast a ballot in their respective Virginia House of Delegates races, where all 100 seats were up for election. As of Tuesday’s count, 53.8% voted for Republicans, 40.4% voted for Democrats, and 5.8% voted for either third-party or write-in candidates, producing a 67-33 Republican edge in the House (Democrats netted only one seat). However, these figures don’t tell the whole story. Only 43 races featured both a Democrat and a Republican, while 45 races were completely uncontested (12 featured a major-party candidate and a third-party entry). Of the 45 uncontested elections, 29 were won by Republicans. In general, regardless of party affiliation, when given only one candidate, voters overwhelmingly choose to vote for the single candidate listed rather than choosing not to vote or to write in a candidate. Had there been challengers in all the uncontested races (overwhelmingly won by Republicans, 29-16), the number of total votes for Democratic candidate for the House of Delegates would have undoubtedly increased more in comparison to the GOP vote total. To gain a more useful understanding of the statewide voting trends for the House of Delegates, we can look at the 43 races that featured both a Democrat and a Republican (some of these races also featured third-party candidates). In those 43 contests, 53.5% cast ballots for Republicans, while 45.5% voted for Democrats. Despite the fact that 53.5% of Virginians cast their votes for Republicans in major-party contested races, the GOP won 79% of those races, or 34 seats. That’s one more seat than Democrats won in all races, contested or not. Overall, the GOP’s 67-seat caucus preserves their veto-proof supermajority for at least the next two years. How did the GOP win a two-to-one majority while Democrats won the governorship, lieutenant governorship and perhaps, after a likely recount, even the attorney general’s office? The most obvious reason is gerrymandering. Republicans were extraordinarily successful at drawing districts in their favor following the 2010 census. On average, each district’s electorate was made up of just over 20,000 voters. Out of 100 races, nine races were decided by less than 1,000 votes. Of these nine races, Republicans won eight of them, with the closest race being decided by 54 votes. The vast majority of House elections were not decided at the polls, but rather by the General Assembly itself back in 2011 during redistricting. This was also true two years ago in the Virginia Senate, where Democrats drew a gerrymandered map that narrowly failed to preserve their upper chamber majority in the 2011 election. In that case, Democrats won a little under 40% of all Senate votes, yet managed to achieve a 20-20 tie.